The author Dave Cook is the Managing director and senior surveyor of Cook Group Ltd. He has been in the preservation & waterproofing industry since 1986. He has the C.S.R.T & C.S.S.W qualifications and is also an Associate member of the Chartered Institute of Building (ACIOB). Dave is also an examiner for the PCA (Property Care association) for the CSRT & CSSW examinations. Dave has extensive experience of waterproofing lift pits, elevator pits etc. Cook Group carry out these specialist works on a National basis. 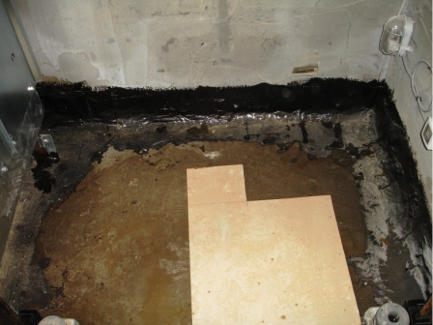 The purpose of this paper is to discuss the reasons why lift pit waterproofing fails so often, whether it is new build / ongoing construction or pits that are several years old. We will also give a summary of the general forms of waterproofing used in a retrospective repair of a lift pit. We need to appreciate that the pit is an integral part of the structure whether it is a multi level commercial lift or a 6 person passenger lift serving 1 floor. The lift pit and shaft have to perform two tasks, they have to act as the housing for the lift mechanism and more relevantly to the pit it has to act as a fixing platform i.e. the pit has to be able to accept mechanical fixings into the floor and walls from the actual lift mechanism. The latter will serve to cause problems for a surface applied waterproofing system. However the causes of future water ingress are invariably designed into the pit long before ground has been broken or even before the contract has been awarded. · All resulting in costs! So the waterproofing element of a lift pit or escalator pit is undeniably a key element in the design process. But is it designed as such? EN81 states that the pit should be dry. A lift pit is almost always going to be a structure that is below ground, therefore for those pits that are below ground BS8102:2009 (The Protection of Below Ground Structures Against Water from the Ground) applies, have some lift pit designers even heard of BS8102? It’s only a lift pit! No one lives in it and an engineer will only stick his head in it every 6 months? A controversial statement maybe, and we accept that statement does not apply to all designers. Lift pits are generally constructed in 2 ways. The issues start when the walls are designed! 10kn concrete blocks (as an example) are laid on edge to form the earth retaining wall or a 225mm solid wall built from class B semi engineering bricks with a 100mm concrete block wall built in front to form the actual dimensions of the pit walls. In between this construction we decide to place a waterproofing membrane. Poured concrete walls are certainly a more robust form of construction; however this type of construction can also have its flaws. These are generally built to BS EN 206 / BS 8500 & BS 8110. There will be a construction (or kicker) joint at some point where the wall meets the floor slab, these are usually stepped up from the slab by around 50mm – 100mm or the joint can be actually at slab level. However as with concrete block wall construction site conditions can make the reality of installing this type of product very difficult. If you get them too close to either face of the concrete they can blow chunks of concrete off when they begin to swell. If the walls are only 150mm-200mm thick it is difficult to get physically get in between the steelwork to fit the sealing strip correctly. 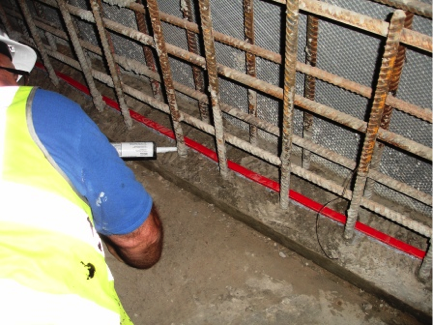 The shuttering or formwork tie bolt holes can also create their own unique issues, a 20mm clear hole that runs through the wall, if these holes are not backfilled correctly they will create weak points for any proposed waterproofing system. The standard waterproofing detail is usually to apply a bitumen based self adhesive type membrane ‘as per the manufacturers instructions’ or even worse the specification places responsibility for the waterproofing element to be ‘by the main contractor’ then it can be a free for all as cost may be the only factor in designing a waterproofing system. All of which are readily available form builders merchants/specialist suppliers. Why do waterproofing systems fail? 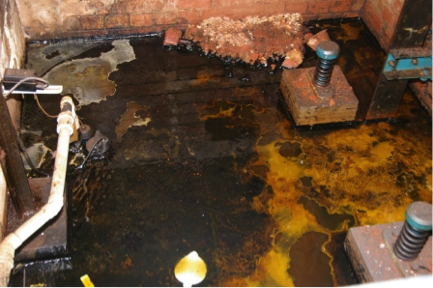 In most cases there is not just one single reason why a lift pit waterproofing system will fail, unless of course your reason is “it hasn’t worked”! In the first instance there is not a system on the market that complies with BS8102:2009 by itself. This anomaly is manufacturer driven either by ignorance or otherwise. A waterproofing system that has been designed in accordance with BS8102:2009 utilising any or a mixture of the above systems will comply. A play on words? Or a huge difference that could have your PI insurers quaking in their boots? Invariably the quality of the installation is going to be the first suspect. Who is installing the product? A ground worker who has bought the materials from a merchant? The site labourers under instruction from the site agent or the merchant’s sales rep? “You have to get this finished today, concrete is coming at 6am tomorrow” said during a cloudburst! Self adhesive bitumen sheet membrane systems are incredibly sensitive to the weather and low temperatures. If these systems are installed during poor weather conditions the likelihood of a failure of the system is exponentially higher. Correspondingly cement based systems are sensitive to temperatures around and below 5ºc and wet weather. GRP lining systems are not weather dependant, however as they are installed during the construction of the pit, all it takes is a pin prick and the system can fail. You would generally find out AFTER the pit has been built and you do not have access to make a repair. Almost equally (if not more so) the actual design and specification of the waterproofing system will contribute to a failure. Was the installation doomed to be installed poorly and consequently fail because of a poor specification / design choice? The specification states a bitumen adhesive sheet system, however the application is during winter and the site has only just got the steel frame fitted. The full site is open to the elements and will remain so for several weeks after the sheet system is applied. Who is at fault? The installer for not installing the product correctly or the designer for specifying a system that was doomed to fail before the installer got out of the van? Ignoring contractual obligations between a client and a main contractor AND speaking from the authors personal experience only is there a general “it’s only a lift pit, who cares…” attitude, lift pit waterproofing systems can be installed before all the site cabins are on site and the site management team are on site. Or when the lift waterproofing system is installed there is an awful lot more going on around the site, so site management or quality control is not as good as it might be. So to conclude why waterproofing systems fail, it is predominantly a result of poor installation, coupled with poor design of the actual structure. The equation is simple. The less money spent on a good waterproofing system = the greater the risk of failure and from the authors experience this is regularly the week before handover to the client! 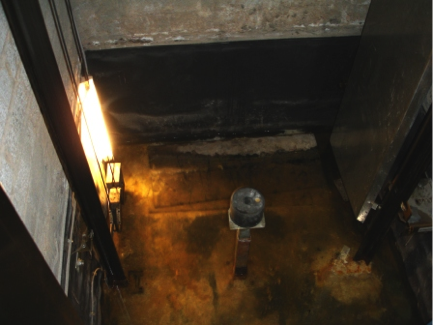 A common issue when trying to stop water ingress into a leaking lift pit is that contractors will try and use the range of products that may have been originally used when the pit was built. The majority of these systems are simply not fit for purpose when carrying out a retrospective lift pit repair. This is a very common yet misguided solution that is used all over the country. The idea behind fitting a sump pump is born out of ignorance, the “you can’t stop it, pump it out” mentality is steeped in danger! In the first instance you need to break into a reinforced concrete base that has been specifically designed to take the loading of the lift mechanism, the actual lift shaft and possibly other areas of the building. This raft WILL NOT have been designed for someone to come along and cut a hole into the concrete which will invariably involve exposing the steel reinforcing or worse cutting through it. The other major issue is an environmental one, which is exacerbated dramatically if the lift is a hydraulic one. Before water is pumped out of a lift pit it will no doubt be contaminated by hydraulic oil, though even grease from the lift mechanism will contaminate the water. Add to this that most sump pump installations do not have a sump created to the correct dimensions, the pump is poorly specified (i.e. what was available at the time) and the exit pipework is usually under undersized (flexible hose is a favourite) and has too many bends. Why does this matter? Quite simply because the greater the resistance in the pipework means the pump has to work harder and the harder it works the greater the loss in performance and its service life. Another common quick fix, what will applying this type of product usually achieve? More expense in applying the correct fix as this kind of product will need to be mechanically removed! We’ve seen GRP lining systems that someone has attempted to retrofit AFTER the lift mechanism has been installed. 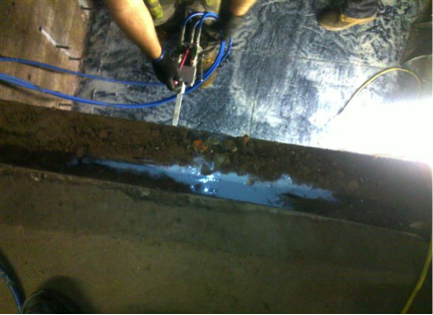 This picture shows a self adhesive bitumen sheet system applied to the wrong side of the lit pit! Needless to say, none of the above attempts worked. How do we retrospectively waterproof a lift pit? Our aim here is to give a brief overview of the long term solutions that can be used to successfully waterproof a lift pit. These are not exhaustive and of course each lift pit can be (and usually is) different and the system used adapted for that specific property. Some of the finer points of our specifications are commercially sensitive and certainly from Cook Group’s experience have been born out of many years experience. 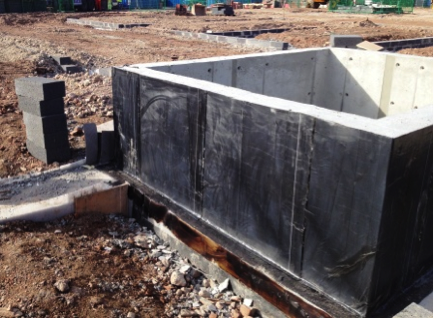 When the lift pit waterproofing system was originally designed, the objective was to effectively cocoon the pit in a waterproof membrane and thus prevent ground water ingress. Ultimately this basic principle is what is required to achieve a successful retrospective repair. As we have established earlier there are primarily two different types of wall construction. Poured concrete and concrete block / brick built walls. Both require different forms of waterproofing. Assuming the concrete base is in good condition and has not been compromised, little work is usually required other than to prepare the substrate correctly and to apply a cement based waterproofing slurry. The source of water ingress is likely to be through the construction joint (or kicker joint as it is also known). Sometimes the construction joint is below floor level, particularly if a screed has been applied since the base was formed. Then you need to seal the wall/floor joint. These sealing works are carried out using polyurethane resins injected under high pressure using specialist pump equipment. It is common after carrying out the preparation works for water to be flowing freely into the pit. This is where specialist skill and knowledge comes to the fore as different resins are used under different conditions, for example water entering through drill holes under pressure will need pre injecting with a temporary fast reacting resin before the permanent resin repair can be injected. As per above assuming the concrete base is in good condition and has not been compromised, little work is usually required other than to prepare the substrate correctly and to apply a cement based waterproofing slurry, it is worth highlighting however that the timing of applying the slurry is extremely important in relation to carrying out the other waterproofing works to the pit. The method of waterproofing a brick/block built pit is to effectively inject the walls using water resistant resins that form after they have been injected. These resins are different to those used on concrete pits, some can be different versions of the polyurethane resin systems, other systems we use are acrylic based hydro structure resins. A firefighters lift or fire fighting elevator as they are also known are a different animal from a waterproofing perspective. The pit and shaft has to be designed to allow water from fire fighting to enter it and be pumped out or should we say allowed to exit at a certain flow rate, this to allow the lift mechanism to remain operational for a certain amount of time according to EN81-72. 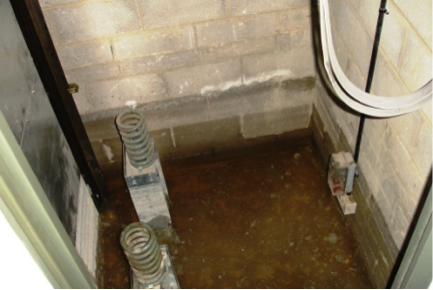 This can be a challenging exercise particularly in a retrofit repair situation where ground water enters the lift pit from a failed waterproofing system. There are other issues to consider when specifying either a retrospective or a new build waterproofing system. Is the pit in an area that is subject to Radon control measures? Methane? Carbon dioxide? The subject of ground gases and the control measures that may be required are too in depth for this paper, however it is something that the specifier should be aware of. These issues can be minimised by building the pit right first time and by having the waterproofing installed by a qualified waterproofing specialist with specifically trained installers to NVQ level. Equally if not more so a retrospective repair should be carried out by a qualified waterproofing specialist with specifically trained installers to NVQ level. This is a fascinating subject and I’m grateful to you for taking the time and for being so generous in sharing your knowledge and experience. Whilst I am already a happy customer, having used your lift pit waterproofing service before, I am delighted to recommend Cook Group to any of my clients or friends in the trade.